Do you feel the need to be more organized and/or more productive? Do you spend your day in a frenzy of activity and then wonder why you haven't accomplished much? Then these time management tips are for you — they'll help you increase your productivity and stay cool and collected. This is the first thing you have to understand about time management, that no matter how organized we are, there are always only 24 hours in a day. Time doesn't change. All we can actually manage is ourselves and what we do with the time that we have. Appreciate this. Internalize it. And move on as soon as possible to the next tip. Many of us are prey to time-wasters that steal time we could be using much more productively. What are your time bandits? Do you spend too much time Internet surfing, reading email, Facebook posting, texting, or making personal calls? Are you a time waster? Tracking daily activities helps to form an accurate picture of how much time you spend on various activities, which is the first step to effective time management. Remember, the focus of time management is actually changing your behaviors, not changing time. A good place to start is by eliminating your personal time-wasters. For one week, for example, set a goal that you're not going to take personal phone calls or respond to non-work related text messages while you're working. Think of this as an extension of the third time management tip. The objective is to change your behaviors over time to achieve whatever general goal you've set for yourself, such as increasing your productivity or decreasing your stress. So you need to not only set your specific goals but track them over time to see whether or not you're accomplishing them. Whether it's a Day-Timer, a software program, or a phone app, the first step to physically managing your time is to know where it's going now and planning how you're going to spend your time in the future. A software program such as Outlook, for instance, lets you schedule events easily and can be set to remind you of events in advance, making your time management easier. You should start each day with a session prioritizing the tasks for that day and setting your performance benchmark. If you have 20 tasks for a given day, how many of them do you truly need to accomplish? Delegation is one of the hardest things to learn how to do for many business owners, but no matter how small your business is, there's no need for you to be a one-person show — you need to let other people carry some of the load. Delegation shares the tasks you'd be better off leaving to someone else, so you can make the most of the time that you have. While crises will arise, you'll be much more productive if you can follow routines most of the time. For most people, creating and following a routine lets them get right down to the tasks of the day rather than frittering away time getting started. From client meetings to dentist appointments, it's impossible to avoid waiting for someone or something. But you don't need to just sit there and twiddle your thumbs. Technology makes it easy to work wherever you are; your tablet or smartphone will help you stay connected. You can be reading a report, checking a spreadsheet, or planning your next marketing campaign. And here's the most important time management tip of all. 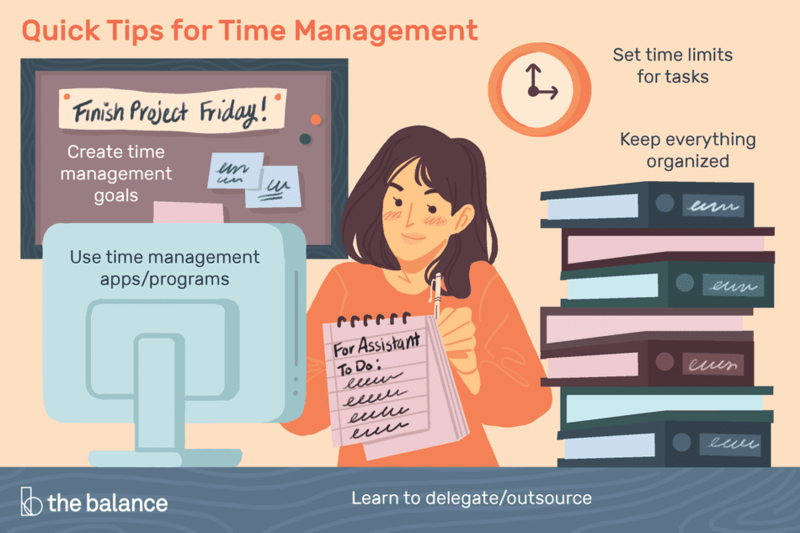 You can be in control and accomplish what you want to accomplish — once you've come to grips with the time management myth and taken control of your time.